Flag birds - as some call the Red-headed Woodpecker is probably the most known by non birdwatchers, due to an old Saturday morning cartoon show. Often its personality matches its striking coloration as this bird can get quite aggressive toward other woodpeckers or visitors that get too close to a nest tree or food cache. This bird measures about 8 1/2 to 9 1/2 inches long. The only woodpecker with an all red head. The body and wings patterned with black and white. In flight, you'll notice the white rump and white inner trailing half of the wings. You'll find these birds in groves, open woodlands, farmlands, suburbs, and shade trees. Common bird east of the Rockies. These birds spend a great deal of their time flycatching from exposed perches. Red-headed Woodpeckers will eat insects, spiders, earthworms, mice, nuts, berries and corn. 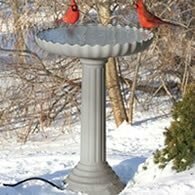 You can attract these bird to your feeders by providing black oil sunflower seeds and by placing suet in your suet feeders. 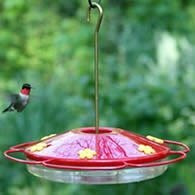 These birds have the ability to catch insects in midair, as well as foraging on leaves and on the ground. You'll find that they cache pieces of nuts and acorns, also insects, in small cavities for use during nonbreeding season. 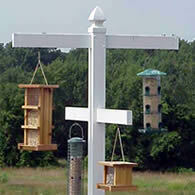 They will defend these caches from other woodpeckers, jays, and crows. 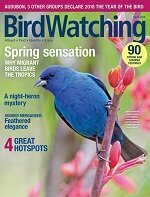 There has been concern for the numbers of these birds, especially in the Northeast, where they have declined. One source of their problem is competition for nest holes from starlings and other hole-nesters. Another is the decline in suitable habitats that they favor which are dead trees or large dead limbs that are often removed for firewood or to reduce the hazard of fire. To these birds dead wood is a necessity for life. 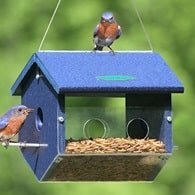 You can help by leaving some dead trees on your property and placing properly constructed bird houses in your backyard. The female lays 4 to 7 white eggs in a cavity excavated 5 to 80 feet above ground. Both male and female share incubation which last about 14 days. The young leave the nest in about 30 days after the eggs hatch. Northern populations of the Red-headed Woodpecker are migratory and concentrate in woods with abundant acorns.